As a young man in the Dakota Territory, Roosevelt saw firsthand how human activities could harm the environment. Completion of the Transcontinental Railroad in 1869 had pushed civilization westward, and rail lines and the towns that build up around them cut gashes through the pristine grazing lands of the buffalo or bison. Buffalo were being killed on a vast scale for their highly valued hides, and the trains made it easy to transport the hides to market. In just two decades, the great bison that once had thundered across the plains were driven nearly to extinction, with just small bands roaming in areas where great herds used to darken the prairie as far as the eye could see. By the time Roosevelt wrote about them in 1893, fewer than 500 wild buffalo existed, and no herd of more than 100 had been seen since 1884. 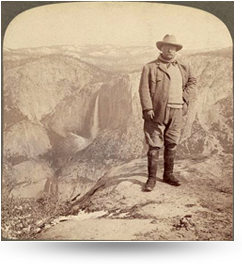 Roosevelt, an avid adventurer and lover of nature, dedicated himself to protecting both wildlife and natural resources. He recognized that without dramatic action, the rich natural resources and incomparable landscapes of our country would disappear as quickly as the buffalo, leaving future generations without a legacy of natural splendors. As president, Roosevelt provided federal protection for almost 230 million acres of land, an area equivalent to the entire Eastern Seaboard from Maine to Florida. He sat aside 150 national forests, the first 51 federal bird reservations, five national parks, the first 18 national monuments, the first four national game preserves and the first 24 reclamation, or federal irrigation, projects, designations that were bitterly opposed by commercial interests. Roosevelt also appointed as the first Chief of the U.S. Forest Service the visionary Gifford Pinchot, who shared his philosophy of natural resource conservation through sustainable use, and he convened four study commissions on conservation for policymakers and leading authorities to shape thought about the then-new field of conservation.